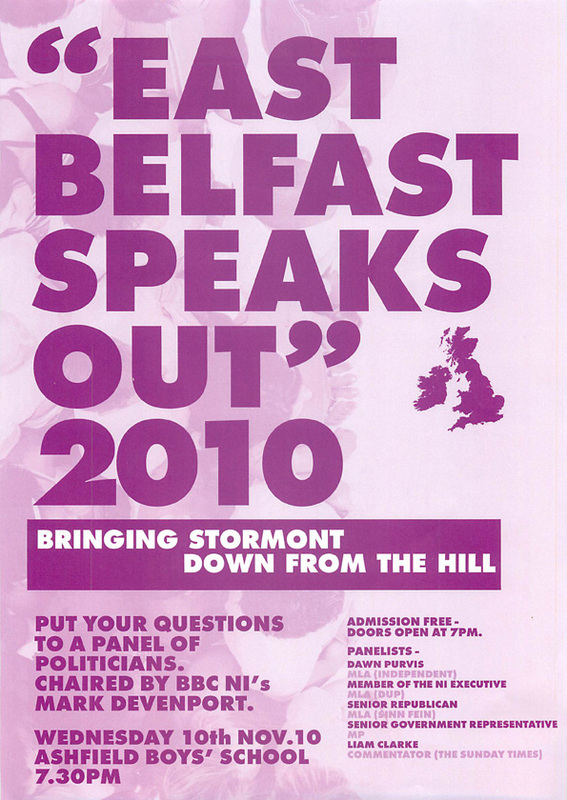 Building on the success of the previous year, we approached the First Minister and Deputy First Minister of Northern Ireland with an invitation to join our panel for a new debate in November 2010. We also invited Owen Paterson MP, NI Shadow Secretary, for a second time. All three accepted our invitation, but the Police Service of Northern Ireland (PSNI) did not permit us to publicise their presence on our panel for reasons of security. Our other two guests were Dawn Purvis MLA (Independent, formerly of the Progressive Unionist Party [PUP]) and Liam Clarke, a well-known political commentator for both The Sunday Times and The Belfast Telegraph. Just a short time before the event Mr. Paterson let us know once again that he would be unable to attend after all, but he sent along his Minister of State, Hugo Swire MP. Despite the blackout imposed on details of the panel makeup, a very large crowd showed up to put their questions to the panellists – so large indeed that the doors had to be locked before the event began for health and safety reasons as there were already over 400 people in the audience. As before, the questions were wide-ranging and audience participation was extremely high. Mark Devenport (BBC) was in the Chair and managed the many challenges of the evening very well, keeping the flow of questions and answers very smooth. As in 2009, written feedback received from the audience showed a 100% level of support and enthusiasm for the event, with 100% also supporting the need for similar events to be rolled out across the whole province. For more details of the questions and comment on the event see Alan in Belfast.